We Icelanders love our caves and we have good reason to. Some of Iceland’s caves are nothing short of amazing and Lofthellir lava cave is one of those wonders. Lofthellir literally means air or sky cave and is located in northeastern part of Iceland. It’s a 3500 years old, natural lava cave and inside are the most magnificent ice sculptures known in Iceland. Some even say they can detect some ice trolls in the cave. I, however, can make no such guarantees. Or can I? Visiting Lofthellir is something that everyone should do in Iceland. It’s one of the most beautiful landscape you will see and the experience is out of this world. You feel like you’ve entered a magical land, far, far away from civilization and you don’t ever want to leave. But I recommend that you don’t overstay your welcome since the temperature inside the cave is around 0°C. So bring warm clothes – you’re going to need them! Unfortunately the cave is not for everyone. To reach the cave you have to hike some 30 minutes across a smooth lava field. If that wasn’t enough, you also have to crawl on all fours to enter the cave and the entry way is quite short and narrow. The cave is about 370 meters long and on the floor of the cave is ice and water so it can be quite tricky maneuvering inside this natural gem. Therefore, it is not suitable for young children, claustrophobic people or people that are not in the best physical condition. For those of you who can handle Lofthellir, you should know that it’s close to Lake Mývatn in the north of Iceland. 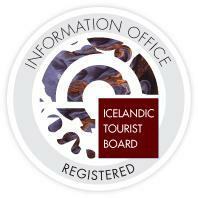 Must See in Iceland strongly recommends that you take a guided tour there to get the most out of your experience. And to be as safe as possible since the Icelandic weather and nature conditions are unpredictable. Check out Saga Travel’s tour to Lofthellir, which departs from Akureyri.